Before we can write our first program, we need to learn how to create new programs within our Integrated Development Environment (IDE). 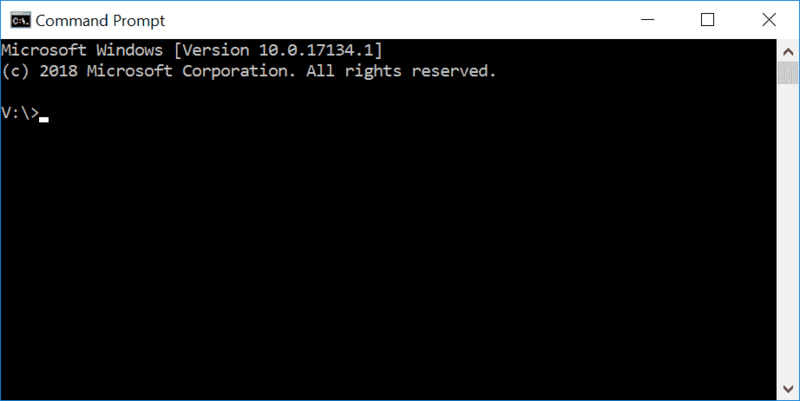 In this lesson, we’ll cover how to do that, and you’ll also compile and execute your first program! To write a C++ program inside an IDE, we typically start by creating a new project (we’ll show you how to do this in a bit). A project is a container that holds all of your source code files, images, data files, etc… that are needed to produce an executable (or library, website, etc…) that you can run or use. The project also saves various IDE, compiler, and linker settings, as well as remembering where you left off, so that when you reopen the project later, the state of the IDE can be restored to wherever you left off. When you choose to compile your program, all of the .cpp files in the project will get compiled and linked. Each project corresponds to one program. When you’re ready to create a second program, you’ll either need to create a new project, or overwrite the code in an existing project (if you don’t want to keep it). Project files are generally IDE specific, so a project created for one IDE will need to be recreated in a different IDE. Create a new project for each new program you write. When you create a new project, you’ll generally be asked what type of project you want to create. 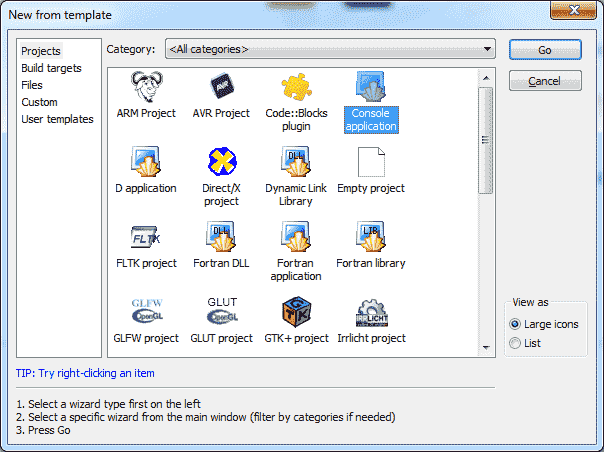 All of the projects that we will create in this tutorial will be console projects. A console project means that we are going to create programs that can be run from the windows, linux, or mac console. By default, console applications have no graphical user interface (GUI), print text to the monitor, read input from the keyboard, and are compiled into stand-alone executable files. This is perfect for learning C++, because it keeps the complexity to a minimum, and ensures things work on a wide variety of systems. Don’t worry if you’ve never used a console before, or don’t know how to access it. We’ll compile and launch our programs through our IDEs (which will invoke the console when necessary). When you create a new project for your program, many IDEs will automatically add your project to a “workspace” or a “solution” (the term varies by IDE). A workspace or solution is a container that can hold one or more related projects. For example, if you were writing a game and wanted to have a separate executable for single player and multiplayer, you’d need to create two projects. It wouldn’t make sense for both of these projects to be completely independent -- after all, they are part of the same game. Mostly likely, each would be configured as a separate project within a single workspace/solution. Although you can add multiple projects to a single solution, we generally recommend creating a new workspace or solution for each program, especially while learning. It’s simpler and there’s less chance of something going wrong. Traditionally, the first program programmers write in a new language is the infamous hello world program, and we aren’t going to deprive you of that experience! You’ll thank us later. Maybe. If you select the code from these examples with your mouse and then copy/paste it into your IDE, you may also get the line numbers (depending on how you made the selection). If so, you’ll need to remove the line numbers manually before you compile. First, make sure Visual C++ is listed on the left side. If you don’t see Visual C++, then you probably forgot to choose to install the Desktop development with C++ workload when you installed Visual Studio. In that case, go back to lesson 0.6 -- Installing an Integrated Development Environment (IDE) and reinstall your Visual Studio as indicated. If you’re using Visual Studio 2017 v15.3 or newer, underneath Visual C++, select Windows Desktop and then select Windows Desktop Wizard in the main window. If you don’t see Windows Desktop as an option, you’re probably using an older version of Visual Studio. That’s fine. Instead, choose Win32 and then Win32 Console Application in the main window. 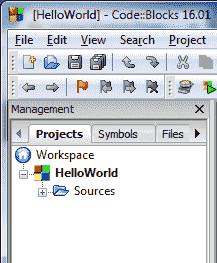 Down below, in the Name field, enter the name of your program (replace the existing name with HelloWorld). In the Location field, you can optionally select a different location for your project to be placed into. The default is fine for now. Click OK. 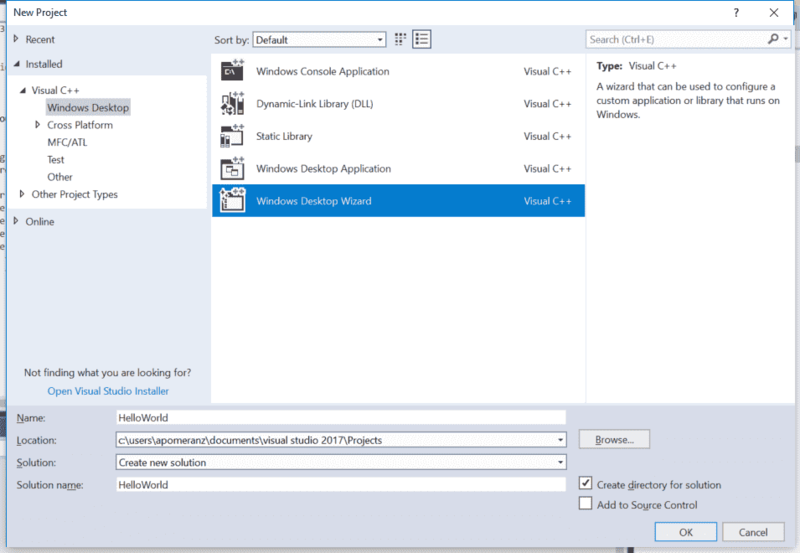 If you’re using an older version of Visual Studio, the Win32 Application Wizard will launch. Press Next. Make sure you uncheck Precompiled Header. Then click Ok or Finish. Now your project is created! On the left side, you should see a window titled Solution Explorer. Inside this window, Visual Studio has created a solution for you (Solution ‘HelloWorld’). Within that, with the name in bold, is your new project (HelloWorld). 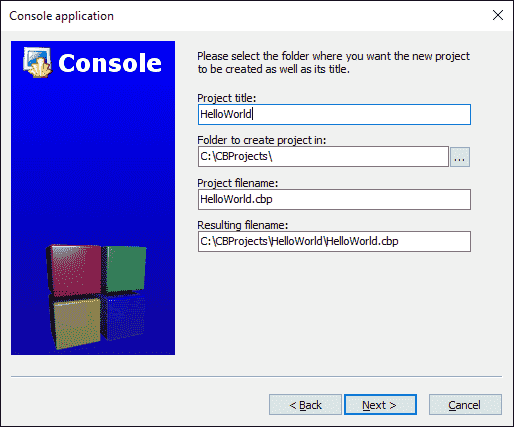 Within the project, Visual Studio has created a number of files for you, including HelloWorld.cpp (underneath the Source Files tree item). You may also see some other .cpp or .h files, which you can ignore for now. This means your compile was successful! Q: I got error C1010 ("fatal error C1010: unexpected end of file while looking for precompiled header. Did you forget to add '#include "stdafx.h"' to your source?"). What now? You forgot to turn off precompiled headers when you created your project. Recreate your project (as per the instructions above) and make sure to disable precompiled headers. That is the result of your program! Congratulations, you’ve compiled and run your first program! Select Console application and press the Go (or Create) button. If you see a console application wizard dialog, press Next, make sure C++ is selected and press Next again. Now you will be asked to name your project. Title the project HelloWorld. You can save it wherever you wish, though we recommend you save it in a subdirectory off of the C drive, such as C:\CBProjects. You may see another dialog asking you which configurations you want enabled. The defaults should be fine here, so select Finish. Now your new project has been created. Inside the HelloWorld project, expand the Sources folder, and double click on “main.cpp”. You will see that a hello world program has already been written for you! That is the result of your program! Linux users may need to install the additional packages before Code::Blocks will compile. Please see the Code::Blocks installation instructions in lesson 0.6 -- Installing an Integrated Development Environment (IDE) for more info. HelloWorld (or possibly ./HelloWorld), and you will see the output of your program. First, look at the error message that the compiler gave you. Most often, it will contain a line number indicating which line was in error. Examine both that line and the lines around it, and make sure there are no typos or misspellings. Also make sure you’re not including line numbers in your code. Second, look at the Q&A in lesson 0.8 -- A few common C++ problems, as your issue may be covered there. Third, read the comments below -- someone may have encountered the same issue. Finally, if all of the above fail, try searching for your error message on Google. It’s likely someone else has encountered this before and figured out how to fix it. 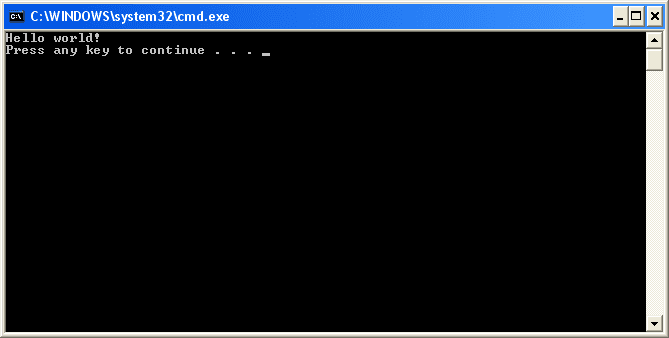 Some compilers (such as Bloodshed’s Dev C++) don’t automatically pause the console screen after the program has finished executing. Your program is running, but the output window is closing before you can view the results. This will cause your program to wait for the user to press a key before continuing, which will give you time to examine your program’s output before your compiler closes the console window. Other solutions, such as the commonly suggested system("pause") solution may only work on certain operating systems and should be avoided. Your anti-virus or anti-malware may also be blocking execution of the program. If that’s the case, try temporarily disabling your scanners and see if the problem resolves. Visual Studio will not pause at the end of a console application if it is run with debugging (Debug Menu > Start Debugging). If you want it to pause, you can either use the code solution above, or run your program without debugging (Debug Menu > Start Without Debugging). Congratulations, you made it through the hardest part of this tutorial (installing the IDE and compiling your first program)! Don’t worry if you don’t understand what all the different lines in the Hello World program do. We’ll look at and explain each line in detail at the start of the next chapter. Please let me ask you about Visual Studio 2019. In wizard "Configure your new project" below text fields it is written next to a small box: "Place solution and project in the same directory". What does it mean, and what is its effect in practice? By default, VS2019 places your code files under //. If you check that checkbox, it will create your code files under / (no solution subfolder is created). This will have no impact on your code -- it's just an organizational thing. Please let me say you my understanding. Suppose project name is "HelloWorld". 1. If I do not check box, V.S. creates two folders, both with name "HelloWorld", one inside other. Including folder is the solution-folder, and included (subfolder) is the project-folder. 2. If I do check box, it creates project-folder only. So I'm just starting to learn Visual Studio with C++ and am writing my first Hello World program. When I run the program, I get the right output but the program also lists a directory path. I was wondering how I get rid of this directory path so the program just shows the Hello World. That's a Visual Studio specific thing that it does when it holds the console window open for you rather than closing it immediately. I'm not sure if it's possible to disable. As far as I know, Dev-C++ is no longer supported. Maybe try a different compiler? c:\users\liz\source\repos\HelloWorld\Debug\HelloWorld.exe (process 10088) exited with code 0. Any idea why my program has that extra middle line in it? Your compiler is providing some additional debugging related information (as well as the "Press any key to close this window..."). You can ignore this. >Visual Studio will not pause at the end of a console application if it is run with debugging (Debug Menu > Start Debugging). If you want it to pause, you can either use the code solution above, or run your program without debugging (Debug Menu > Start Without Debugging). Using the Windows Desktop Wizard in VS2017 will lead to a project with all configurations at Properties > Linker > System > Subsystem set to "/SUBSYSTEM:CONSOLE" which will cause it to pause in any configuration with or without debugging. Setting that option in an empty project should be good enough to achieve the same result. I don't see that behavior -- my VS 2017 project has /SUBSYSTEM:CONSOLE and it doesn't pause at the end of the program when run with debugging. I heard a lot of good things about VS Code so I installed it on my laptop (Linux) instead of Code::Blocks. However it is very different than using it on Windows, and as a beginner I’m afraid there are steps that I might have missed. Would it be possible for you to include a section on how to use VS Code on Linux? VS Code doesn't come with a compiler integrated. As such, it's a little more complex of an installation than I like to recommend to new folks. If you want to chase down how to install it with a compiler elsewhere (e.g. https://code.visualstudio.com/docs/languages/cpp), by all means, use it. But I won't recommend it here. It seems you're confusing VS (Visual Studio) with VScode (Visual Studio Code). VS is an IDE whereas VScode is a feature-rich, extensible text editor. I highly recommend VScode, it's a great, lightweight editor. Don't worry about the length of that article, you only need the content up to "Debugging your code"
There's only one thing that's not good about that article, and that's invoking the compiler directly. You should use CMake (You can start with using the compiler directly, but you should switch to CMake at some point). Thanks nascardriver for the pointer! This command is specific to Debian and its derivatives. Other Linux distributions easily name their build package with other names. For instance, Arch Linux calls it 'base-devel', and would install it with 'pacman -Syu base-devel'. Perhaps consider making a note of this. "When you choose to compile your program, *the* all of the .cpp files in the project will get compiled and linked". everything worked smoothly although it reported an error first but I took a deep breath,analyze this error and got rid of it. I am happy to learn here, Alex you be too much. 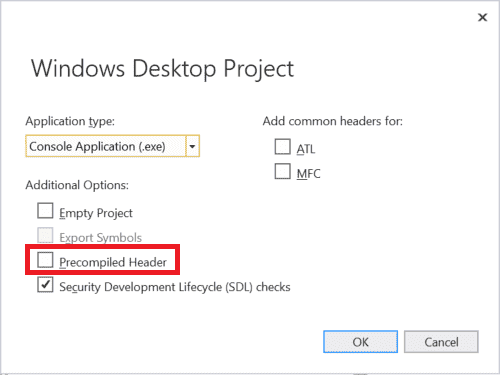 What does precompiled header means ? Why did you turn it off ?How does it affect the build and compile operation ? Precompiled headers are an option that, if used correctly, can speed up compilation times for large projects with lots of files. Since precompiled header support varies by compiler, and our examples are fairly small, we turn them off for simplicity. This helps keep the examples shorter, and reduces the number of potential things that can go wrong when trying to learn. But for large programs, precompiled headers can be very useful. I've added an item to my to-do to come back to precompiled headers in the future and talk about them some more. Make sure you followed the project creation steps as shown in the tutorial. If the error persists, share your source code and exact error message, including the line number. Thanks for pointing out the typo. Fixed! on the top of this page : the author wrote: "new programs within our Integrated Desktop Environment (IDE)", this is incorrect, IDE stands for Integrated development environment. Other that these ......This course is pretty amazing !!! I figured most users would read the lesson and then navigate, not navigate right off the bat. How are you navigating the site in such a way that a top-nav to adjacent lessons would be useful? Thanks! Your entire C++ course is particularly well fitted and conducive to such type of learning behaviors patterns, as everything is concise yet comprehensive and all info must be retained. Put yourself into a beginner's mindset (which I know you did writing these great lessons and this is why people love it so much). This is not like linear story book that only goes forward... people get confused, forget bits, need to check things again, you also make reference to past lessons as well. Going back to the table of content is one more click plus a long scroll to the bottom and does not show you anything but a title. Likewise, getting to previous page button requires the same scrolling down, if this happens to be the wrong page, another scroll down is required to get to the previous page and so on.. This can be done much more ergonomically with top navigation. Also, Imagine a very tall book that you could only flip thru from the bottom of each page! Thanks for the context. What you say makes sense. I'll have to figure out a good way to do this. I appreciate the thoughts and feedback. I have a Mac and I used XCode 10.1. A helpful video on Youtube is titled "How to Create First C++ Hello World Project using Xcode Mac OS X." I got this as the output, instead of the clean version you posted. Is that something I can avoid? I'm using VIsualStudio 2017 Community, version 15.9.4. C:\Users\rrodgers\source\repos\HelloWorld3\Debug\HelloWorld3.exe (process 25180) exited with code 0. Running without a debugger should not keep the console open. See the yellow "For Visual Studio users" box. I have the same display as Rob Rodgers, but with version 15.9.5. I am unsure how you're answer addressed the question. This prompt is given when not in debug mode, either by using ctr + f5, or when using Debug > Start Without Debugging. I see the pathway shows Debug in it, even when we do this, however, could you shed any more light please? It still shows the pathway after either running without debugging, or using the above code. You're seeing this in the console window? Not sure -- it's just Visual Studio telling you what the exit code was, but I'm not sure where this is configured and a google search didn't turn anything up about how to enable/disable it. Yes, i got that too. If you look closely at the picture, it has that exact text there . Is it okay/advantages to set the 'Solution Platform' in Visual Studio to x64 on an x64-machine? Hi, what are the .sln and .vcxproj files and which one should I open?